When seventeen-year-old Rowan Chase finds a skeleton on her family's property, she has no idea that investigating the brutal century-old murder will lead to a summer of painful discoveries about the present and the past. 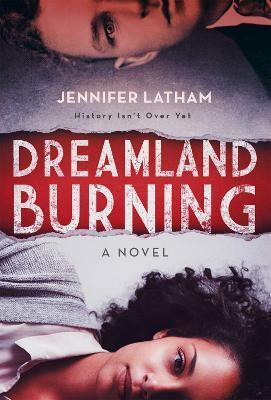 Nearly one hundred years earlier, a misguided violent encounter propels seventeen-year-old Will Tillman into a racial firestorm. In a country rife with violence against blacks and a hometown segregated by Jim Crow, Will must make hard choices on a painful journey towards self-discovery and face his inner demons in order to do what's right the night Tulsa burns. I am not sure I can put into coherent words how madly in love I am with this book. I was really fortunate to receive an advanced reader copy of it. Never in my life have I identified with a main character like this. I usually gravitate away from a lot of the popular YA novels because let's be real, I'm a biracial black woman--I can't see myself in a lot of the white dude protagonists. Jennifer Latham is the type of author I hope to be someday. She seamlessly wove together the stories of a modern day, biracial black teen who discovers a buried body on her family's property with the story of a white and Native American teen in 1920s Tulsa, which was home to Greenwood, the most prosperous African-American neighborhood in the country before the KKK started growing in the area. I read it in less than 24 hours. I stayed up all night (it's been such a long time since I've found a book I could not put down) and as much as I quickly read it and got to the end, I kind of wish I savored it more haha. The research, respect, and heart that went into crafting these characters who realistically struggle and learn from the way racism affects who we are and forces them to decide who they're going to be is really admirable. They felt like real human beings, not caricatures (two of the modern day black characters had an argument stemming from their perception of their own blackness and how they're treated by the world and it was so damn important and beautiful and rare and satisfying to see), framed around the Tulsa Riots--which is a forever relevant story that needs to be told. I was upset I hadn't heard about it sooner.